Some (principally in Antioch) calculated Easter after the same mode of the Jewish reckoning of the Passover – Easter falling on the Sunday after the Jewish feast of 15 Nissan (that is the 15th day of the first month of the ecclesiastical Jewish Calendar). However, this would occasionally allow the celebration of Easter before the vernal equinox. The Alexandrians, however, celebrated Easter on the first Sunday after the first full moon after the vernal equinox – hence, Easter would never fall before the equinox. According to the Alexandrian calculation, Easter could fall no earlier than March 22 and no later than April 25. In this dispute Pope St. John I sided with the Alexandrians, and this has become the norm in the West. However, many (perhaps all) of the Eastern Churches (both Catholic and Orthodox) follow the Antiochian calculation of Easter. Hence, the Easter celebration in the East and the West does not often coincide. By a happy coincidence, the two methods of calculation yielded the same date this year – on April 24th, Catholics and Orthodox of both the East and the West celebrated the Easter feast. In 526, shortly before Easter that year, Pope St. John I visited Constantinople in order to advise and encourage Emperor Justin in the best means of suppressing the Arian heresy. This was the first papal visit to the East since the time of the apostles and Pope John was greeted with great joy and solemnity – the Emperor even prostrate himself before the Roman Pontiff. On 19 April 526, exercising his authority as the supreme shepherd of the universal Church, Pope John celebrated the Easter Mass in the Hagia Sophia according to the Latin Rite and was seated on a throne which was higher than that of the local patriarch, Epiphanius. Moreover, in a modification of the local tradition, John I (rather than the patriarch) crowned Emperor Justin with a customary Easter crown. 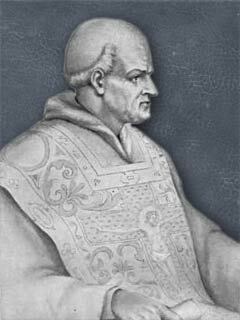 Pope St. John I knew that the unity of the Church is founded in the successor of St. Peter. Though the bishops exercise their authority as the Vicar of Christ in their own dioceses, Peter alone has been established as the supreme shepherd for the whole Church. While the pontiff respects the traditions of local churches, he also brings these traditions together by uniting them in the Tradition. "In this dispute Pope St. John I sided with the Alexandrians, and this has become the norm in the West. However, many (perhaps all) of the Eastern Churches (both Catholic and Orthodox) follow the Alexandrian calculation of Easter. Hence, the Easter celebration in the East and the West does not often coincide." Is there a typo in this? Do you mean "follow the Jewish calculation of Easter."? This article must not have struck a nerve with your usual critics and ascerbic responders. One note, though, Easter this year was April 24, not March 24. I hope you will spend more time in the future discussing the evolution of the Roman vs. Eastern split, how that evolved. I believe there are some, as you point out, Eastern Catholic sects. The interrelationships elude me, and I realize this is a quite complex subject, but seems that a historical review might also provide fodder for highlighting certain tenets of the professed faith. "In this dispute Pope St. John I sided with the Alexandrians, and this has become the norm in the West. However, many (perhaps all) of the Eastern Churches (both Catholic and Orthodox) follow the Alexandrian calculation of Easter." I think that's a typo (Alexandria used twice). I thought that the Greeks used the same calculation but arrive at different dates because of their use of the Julian calendar? @Tim, Thanks for the note about the typo on the date of Easter 2011. I'll change that.